Flowers and trees are starting to bud, but is it too early? Learn below! Is it spring yet? You might be forgiven for thinking so, owing to the warmer weather we’ve experienced here and there over the last few weeks. What in the world is Mother Nature up to with the days of warmer weather followed by cold snaps? It’s not just confusing you – if they could talk, your trees would be saying the same thing. You may have even noticed some of your trees have started to bud. Is it bad if trees start to bud before spring weather takes hold? Trees use the weather as a guide for maintaining a set growth cycle. During the cold winters, the trees are dormant and resting so that they are able to produce new growth during the spring. When warmer weather comes, that signals to the trees to start producing their new growth. Occasionally, and seemingly more often in recent years, unseasonably warm weather comes in, triggering growth cycles in the trees. Why Is Early Tree Budding Bad? When temperatures are warm one day, then freezing the next, it can be extremely stressful on your trees. They start to bud, but then the buds are shocked by the cold weather, leading to damage. 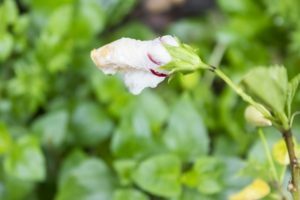 Fruit and flower buds are the most vulnerable to damage. If a cold snap occurs after they begin to flower, they are unlikely to bud again later as they have already used up their energy. This has the secondary effect of disrupting fruit farms and markets and farmers have to take extraordinary measures to protect their crops. Trees, however, can go back into a regular growth pattern if you take some important steps. If the ground isn’t frozen anymore, mulch your trees so that they stay insulated until the warmer weather takes hold. And keep an eye on the forecast. If you see a drop in the temperature upcoming, water your trees thoroughly the night before to keep them hydrated. This entry was posted on Thursday, March 9th, 2017 at 4:25 pm. Both comments and pings are currently closed.